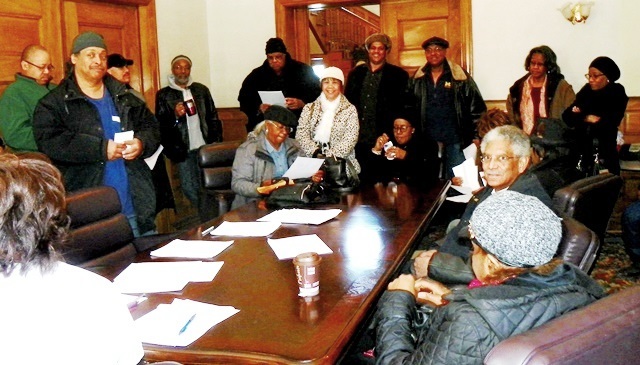 Members of DAREA sign appeal of Detroit bankruptcy plan, initiated by DAREA Pres. Bill Davis, (2nd from left), on Jan. 27, 2015. DETROIT—William Davis, president of the Detroit Active and Retired Employees Association (DAREA), says he is not at all discouraged by U.S. District Court Judge Bernard Friedman’s dismissal Sept. 29 of his appeal of the Detroit bankruptcy plan, along with four similar appeals filed by other retiree groups. Davis’ appeal had asked that cuts to retirees’ pensions and benefits be nullified, on grounds that they violated Art. 9, Sec. 24 of the Michigan State Constitution, which states public retiree pensions cannot be “diminished or impaired,” as well as provisions of the U.S. Bankruptcy Code. The Illinois State Supreme Court recently ruled vigorously against cuts to state retirees’ pensions and benefits based on an almost identical clause in that state’s constitution. The Court held the Constitution represented “the will of the people,” and could not be challenged. Bill Davis carries DAREA’s signature banner at protest against tax foreclosures June 8, 2015. Freep reporter Matt Helms quoted Detroit Corporation Counsel Melvin (Butch) Hollowell. 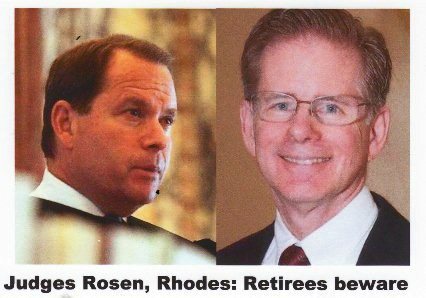 Davis noted Friedman’s boss, Chief Judge Gerald Rosen, who held closed door “mediation sessions” during the case, and bankruptcy judge Steven Rhodes will be receiving “Dennis W. Archer” awards from Jones Day at the Detroit Institute of Arts Oct. 13. The behemoth global law firm represented Detroit Emergency Manager Kevyn Orr during bankruptcy proceedings and is now celebrating its establishment of an office in Detroit. Davis noted that Rosen said he thought retirees should have taken deeper cuts than the 4.5% slash in their pensions, the raiding of their Annuity Savings Funds, the loss of COLA and impairment of health care, which amounted to a total of $7 billion in losses. 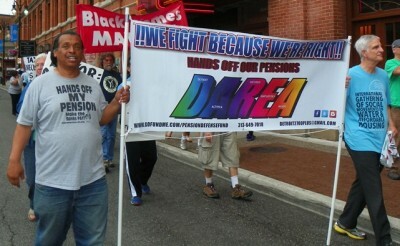 “It sounds to me like Rosen doesn’t really believe that public workers should get pensions at all,” Davis said. “Equitable mootness” means the bankrupt party has taken irrevocable financial steps in enacting the bankruptcy plan. Older city retirees were among hundreds who protested outside bankruptcy court April 1, 2014. Friedman also denigrated Davis suggestion for replacing pension cuts. Davis’ appeal noted that Chapter 9 bankruptcies are almost never held to be irrevocable, unlike bankruptcies involving corporations and individuals (Chapter 11 and Chapter 7). 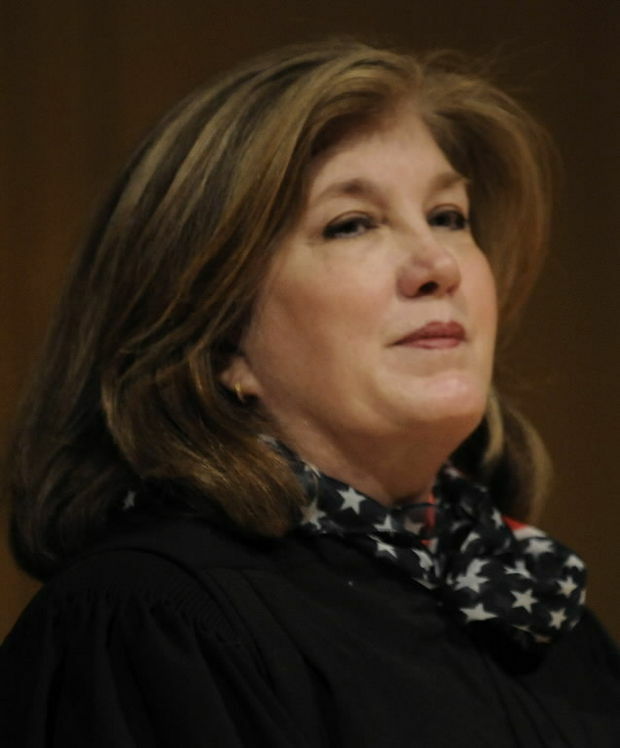 Alabama Senior U.S. District Court Judge Sharon Lovelace Blackburn. 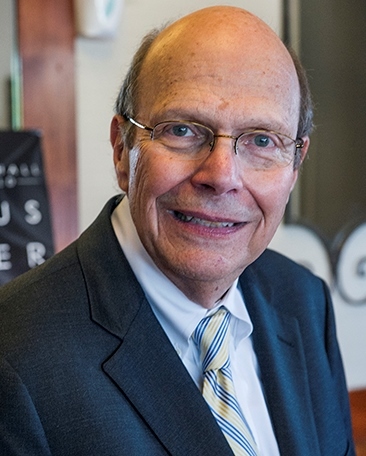 He cited Alabama’s U.S. District Court Judge Sharon Lovelace Blackburn’s ruling Sept. 30, 2014, in the case of Bennett v. Jefferson County, Alabama (see link below story)that the doctrine of “equitable mootness” cannot apply to Chapter 9 bankruptcies. In that case, Jefferson County sewage ratepayers appealed a County Chapter 9 bankruptcy confirmation plan which ordered increases in monthly sewage rate payments from $63 to over $360. “The Ratepayers argue that they are creditors of Jefferson County because they overpaid for sewer services insomuch as the rates they paid incorporated the cost of $1.63 billion in Retired Sewer Warrants that they argue were void (or voidable) because they were obtained through bribery and corruption,” Judge Blackburn said in her opinion. Demonstration in Birmingham, Ala. against Jefferson County bankruptcy plan. 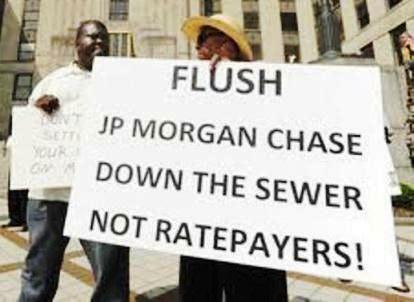 JP Morgan Chase was involved in the corrupt “sewer warrants” that caused the majority of the county’s debt. Judge Blackburn held, “This court finds that “equitable mootness” is not applicable in a Chapter 9 appeal challenging terms of the Confirmation Order as unconstitutional . . . Protesters block entrance to Homrich, DWSD’s contractor in charge of shut-offs, on July 18, 2014. On Sept. 15, Friedman also brutally dismissed an appeal of Judge Rhodes’ ruling denying a moratorium on massive water shutoffs in Detroit, filed by Detroit water customers and various advocacy groups. 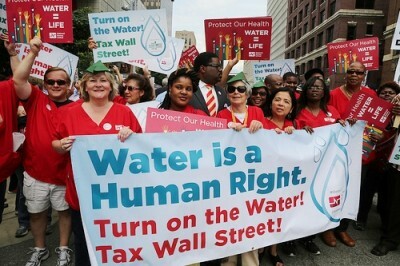 Nurses helped lead protest in downtown Detroit July 18, 2014 declaring water a human right. Rhodes recognized Emergency Manager Kevyn Orr as the City of Detroit at the outset of bankruptcy proceedings. Under 11 U.S.C. 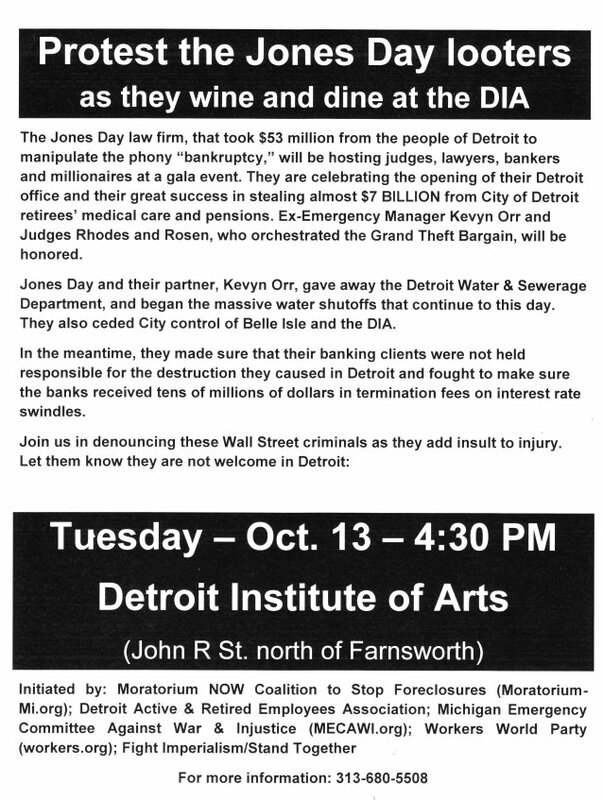 § 904, Orr gave broad consent to stripping the city of its major assets, including the Detroit Water & Sewerage Department and the art collection in the Detroit Institute of Arts, actions that have not taken place in other bankruptcies. Chapter 9 has long been construed as to protect the assets of governmental entities from the claims of creditors. To comply with the UN declaration that “water is a human right,” all Orr and later Mayor Mike Duggan, had to do was consent to end Detroit’s practice of massive water shut-offs. Wealthy partygoers celebrate opening of Frieda Kahlo-Diego Rivera art display in courtyard of DIA. 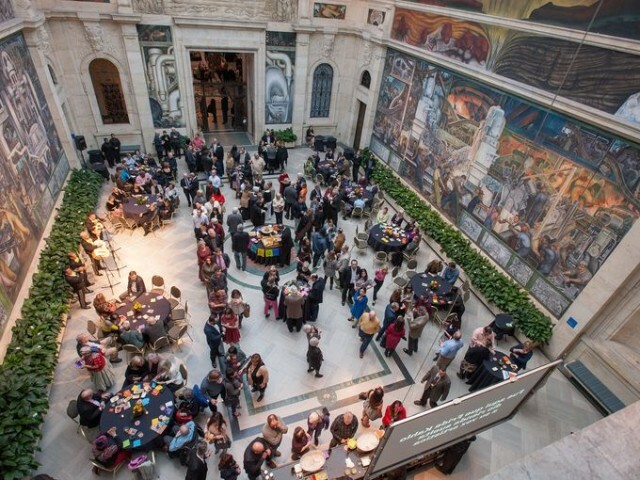 Ironically, they partied in front of Rivera’s world-renowned murals celebrating Detroit workers and advocating his Communist beliefs. 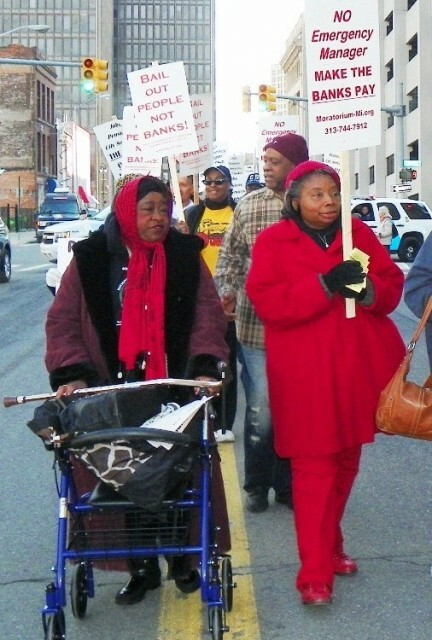 Retirees protest outside Motor City Casino Feb. 25, 2015 at Crains Detroit gala awards ceremony for Kevyn Orr, Steven Rhodes. This entry was posted in Uncategorized and tagged Beatbackthebullies, blacklivesmatterDetroit, DAREA, Detroitbankruptcy, DETROITWATER, MaketheBanksPay, OurWaterOurVote, StopWaronBlackAmerica, WeFightBecauseWereRight. Bookmark the permalink.